I too am a Flower Essence Practitioner, and found Sarah’s combination of Astrology and Essence treatment very insightful. Sarah’s knowledge of your Natal chart allows her into your real time aspects in areas of your life which would benefit most from your attention in the present moment. Therefore, growth and development of self are given a concise path on which to travel. Sarah’s flower essences have been a godsend, helping me face difficult transitions in my life. I have found the flower essences she prepares with so much love and knowledge to work gently, effectively. The ultimate act of confidence was when Sarah started treating my daughter with flower essences. Again their effect was gentle, yet effective and I saw before my eyes, my daughter’s transformation. The compassion, love and reverence Sarah brings to the creation of each of her flower essences remedies is reflected in their wonderful effectiveness. Truly she is gifted and sprit works through her. 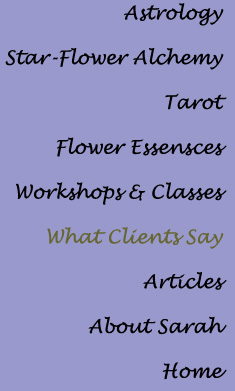 Sarah Fuhro is an experienced Tarot Teacher and Spiritual Reader. Her classes helped me in understanding the process of working with the intuitive and ultimately, communicating with Spirit. Her knowledge further expands the boundaries of other healing modalities such as Flower Essence Therapy that I found enhanced my meditation session. Sarah is a dedicated teacher and practitioner in these 'spiritual arts' and is a very good intuitive, a gifted psychic. -- Deborah Richmond Foulkes, D. D.
In addition to being an excellent astrologer able to point out tendencies, patterns, and trends coming up, Sarah selects flower essences intuitively with amazing results. My work with her to attract more love into my life resulted in a deep and profound intimate relationship which continues to enrich me 2 years later. She helped me get ready. Sarah Fuhro is a warm, intuitive and compassionate practitioner, who brings a wealth of knowledge and depth of understanding to her work. She helped me better understand myself as well as become more aware of the underlying astrological dynamics in my relationships with my loved ones. The flower essence remedies she has given me have supported my growth and happines.